Cambodian Prime Minister Hun Sen defended on Thursday the promotion of his three sons to senior positions in government and the military, citing their education and qualifications. Cambodian and Thai leading journalist networks have entered a cooperative agreement to further boost the roles of journalists and promote mutual benefits of the two nations. Moody’s Investors Service Inc retained Cambodia’s B2 sovereign rating with a “stable” outlook for next year, but warned of slowing global growth momentum against rising uncertainty over longer-term financial and economic stability. The 65th National Day of Cambodia (November 9, 1953-2018) was celebrated at a ceremony in Ho Chi Minh City on November 8. Cambodian prime minister Hun Sen denied on Wednesday he has plans to free opposition leader Kem Sokha, rejecting comments made on Facebook by former opposition chief Sam Rainsy, who said the move will be made in December. Hopes of a direct flight between Cambodia and India were re-kindled this week, with the Indian Ambassador announcing that the flight is expected “soon”. “Good governance requires strong and open institutions that function according to human rights principles,” said Rhona Smith, the Special Rapporteur on the situation of human rights in Cambodia at the end of an 11-day visit to the country. PPCBank and Diners Club International have signed a franchise agreement in Cambodia. The Network Participation Agreement gives PPCBank the privilege to issue Diners Club cards to its customers in Cambodia. The signing of the agreement at Sofitel Phnom Penh Phokeethra follows the establishment of a memorandum of understanding earlier this year. Cambodian Minister of Commerce has pledged to vote for Japan to be the host country of World Expo 2025 at the 164th General Assembly of BIE (Bureau International des Expositions) to be held in Paris, France on Nov. 22-23, 2018. The U.N.’s specially appointed researcher on human rights in Cambodia expressed concern Thursday over the country’s use of pre-trial detention and its failure to conduct trials speedily. With trade and political ties between the governments strengthening, Cambodian exports to Japan rose sharply in the first nine months of the year. The government has collected over $6 million in revenue so far from more than one million hectares of economic land concessions (ELC), says a report from the Ministry of Agriculture published this week. Pursat authorities crackdown on ten marijuana-growing locations in Bakan district. Phnom Penh Court tries two top job recruiting firm officials over cheated 31 people. hen a Chinese national crashed his military number-plated SUV into a stone erected in Phnom Penh in the 1990s to celebrate Cambodian-American friendship, many commented on how it was the perfect metaphor for Cambodia in 2018. Modern slavery is a prominent term of late. Thus far, efforts to deal with it have tended to focus on criminality and the explicit imprisonment of people involved. Yet tackling modern slavery in a meaningful sense isn’t merely a question of identifying culprits and freeing victims. To do so is merely to treat the symptoms of the issue. The Ministry of Environment has told spokespersons at government ministries not to regard journalists as rivals, but rather, as partners working to disseminate news to the public. A European Union delegation on Tuesday visited a fishing community in Svay Rieng province to observe a project aimed at helping them deal with illegal fishing, rear fish, and farm without using chemicals in Peam Ro district. Several of Cambodia’s biggest internet service providers (ISPs) have been hit by large-scale DDoS attacks over the last few days, ZDNet has learned. Ministry of Women’s Affairs is mainstreaming gender in tertiary education in order to promote the knowledge among university students. President of International Association of Francophone Mayors (AIMF) has appreciated Cambodia’s rapid development, especially the city of Phnom Penh. 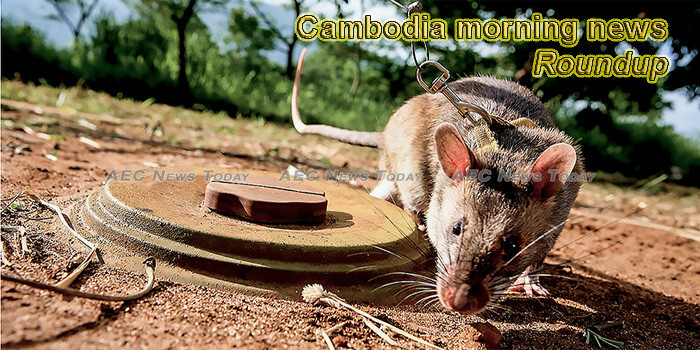 Sambo Manara, a history professor at Pannasastra University of Cambodia, yesterday said Cambodians should be proud on Independence Day because independence was achieved without bloodshed. History oozes from every corner of Siem Reap, a resort town located in northwestern Cambodia. It is the gateway to the famous archaeological ruins of Angkor, the seat of the Khmer kingdom from the 9th to 15th centuries. Angkor, named a World Heritage Site in 1992, has hundreds of complexes, intricate stone temples and structures that include the main temple which is depicted on the Cambodian flag. A delegation of the Senate led by its Second Vice President H.E. Tep Ngorn lay wreaths at the Independence Monument and the Royal Statue of His Majesty the late King-Father Samdech Preah Norodom Sihanouk, located near the Independence Monument, Phnom Penh, this afternoon, to mark the 65th National Independence Day (Nov.​​​​ 9). Twenty-six per cent of Cambodian internet users aged between 15 and 65 years have experienced online harassment while using social media platforms, says a report released by Sri Lanka-based information and communications technology policy think tank LIRNEasia. The Manpower Association of Cambodia and the Association of Cambodian Recruitment Agencies yesterday signed a Memorandum of Understanding with the Thai-Cambodian Relation Association to protect migrant workers in Thailand.